Henryk Chmielewski was born in Warsaw in 1923. He fought in the Warsaw Uprising (where he was nicknamed Jupiter). After the war, he served in the Polish Army as a gunner. He later worked as a graphic designer for Świat Przygód/World of Adventure and Świat Młodych/ Youth’s World. He drew his first comics in 1947. In the following years he came up with three friends: the small, chunky and somewhat sophisticated A'Tomek; the tall, skinny and slightly crazed Romek; and a chimpanzee named Tytus, who was constantly being trained as a human by the latter. The trio was provided with amazing inventions (especially vehicles) by Professor T. Alent. The main characters were scouts. Interestingly enough, the author himself often appeared in the comic book as Pop Hops, and the name of the character – along with his particular hair style and moustache – eventually became Chmielewski's hallmark. Along with Janusz Christa, the creator of Kajko and Kokosz, he was a pioneer of the comic book in Poland, and his characters have become iconic figures. 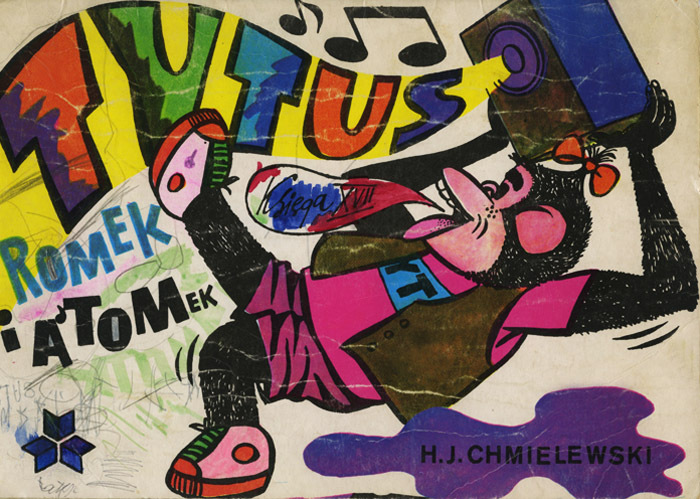 The first comic about Tytus, Romek and A'Tomek (In Space) appeared in Świat Młodych in 1957. Since then, Chmielewski has regularly drawn the subsequent adventures of the trio, some of which have been published in the form of comic books. The first comprehensive edition was published in 1966 (Tytus, Romek and A'Tomek. Book One: Tytus Becomes a Scout). The best volumes were produced in the 70s: Tytus poprawia dwójkę z geografii Polski ( Tytus Retakes a Polish Geography Exam), Tytus na Dzikim Zachodzie (Tytus in the Wild West) and Ochrona zabytków (Conservation of Monuments) The series also had a winning streak in the following decade. Chmielewski regarded Tytus aktorem (Tytus as an Actor), which included many of his personal memories of pre-war Warsaw, as his best comic book from that period. In the 90s, Chmielewski changed his approach to his characters, who had grown up and ceased to be scouts. Subsequent scripts dealt with the socio-political situation in the country (for instance, Tytus joined NATO). In the first decade of the twenty-first century, the ape became an internet user and a graffiti artist. In the last five volumes Chmielewski set the action of the comics in the past (the Warsaw Uprising, the Battle of Grunwald), and they were published as a collection of panels rather than a regular comic book. So far, thirty-one comic books, five historical volumes and two collections of early comics have been published. However, Chmielewski was quite critical of the latest publications, which he judged as being not of high artistic value. The communist authorities stigmatised comics because of their ‘imperialist origins’. For this reason, the first comic book about Tytus in space was stuck in the editorial office for two years. When, in 1957, the Soviet Union launched Sputnik into space, this very circumstance facilitated the publication of the comics. A well-known anecdote reveals that Świat Młodych kept publishing the comics just because they amused the nine-year-old son of one of the communist dignitaries. The topics of the first five comic books about Tytus, such as the military or traffic regulations, were imposed by the publisher. After the communist government was reshuffled, the censorship eased off and the author got more freedom. In later years, Chmielewski redrew large parts of his early comics in order to divest them of their propagandist connotations. The artist also sought to modernize his comic books by applying appropriate amendments to their new editions. It is estimated his comics have sold more than 10 million copies. Chmielewski’s style of drawing is far from realistic. His cartoons are very dynamic, and the story very well presented in terms of narrative and visual execution. The author himself appeared in his comic books, and his characters often asked him to draw some adventures for them. According to one version of the account about the origins of the comics, the character of Tytus was inspired by an accidental ink blot. Chmielewski’s scenarios were addressed primarily to children and they usually contained a moral lesson. However, some especially allusive content could be grasped only by adult readers. A few phrases from the comics have gained cult status. Furthermore, the adventures of the trio have been made into an animated feature film, Tytus, Romek and A'Tomek – Among The Thieves of Dreams, released in 2002. For promotional purposes, a special line of toys was produced – stuffed toys resembling the main characters and cardboard models of a hybrid tram/plane, which were available at KFC. In 2005, Studio Calaris released the computer game Tytus, Romek and A'Tomek - The Army of Rebel Robots, and a radio play based on the thirteenth volume was recorded and released on CD. In 2009, the Polish Post Office issued a series of stamps featuring the main characters of the comics. Chmielewski has written three autobiographical books: Urodziłem się w barbakanie (I Was Born in the Barbican), Tytus zlustrowany (Titus Inspected) and Tarabanie w barbakanie (Barabans in the Barbican). In 2013, the Art Depot of the Museum of Technology in Szczecin held an exhibition entitled Professor Talenta’s Fantastic Vehicles (curated by Wojtek Łowicki), which featured vehicles from the comics reconstructed by Marcin Zbierski, including gwizdkolot (a whistle-shaped vehicle) and prasolot (an iron-shaped vehicle), which the visitors could get in. Plastic figurines of Tytus, Romek and A'Tomek are still available for sale. The artist was awarded the Commander's Cross of the Order of Polonia Restituta, the Order of the Smile and the Gloria Artis Gold Medal for Merits to Culture.